Not much has changed in Cape vineyards, yet much has changed. The ‘not much’ refers to a handful of varieties which small number traditionally make up the majority of the area under vine. Currently (SAWIS 2017 figures) the top eight account for 82.5% of the 94 545 hectares of vineyard; 70.6% if one discounts colombard, mainly used for brandy. Of the remaining seven, six are classic French varieties; the other is pinotage. Today we take this order of things as a given, yet as recently as 2000, shiraz and merlot weren’t in the top seven and hanepoot filled that seventh spot. That’s as a by the by, for one only has to look down Platter’s index to see how those grapes dominate the local wine scene. I’ve always believed, and often voiced such belief, that we should be broadening the varietal spectrum, even more so now with the accruing information on climate change. I was once shouted down by an eminent English wine person, who would have none of it, saying we should get right what we already have. Perhaps it then didn’t occur there may be other varieties which could perform even better than those Frenchies, which are mainly from cooler climes of that country. With the ‘discovery’ of the Swartland and the warmer reaches of the Olifants River up the West coast, so heat-loving varieties from the South of France are showing just how much they like it here too. But, we’re still in France. Or we were. Changes are happening, even if new varieties sometimes have as much to do with the producer’s connections with the country as suitability. Italian and Portuguese grapes are popular partly for these reasons. Climate change is also starting to influence thinking. 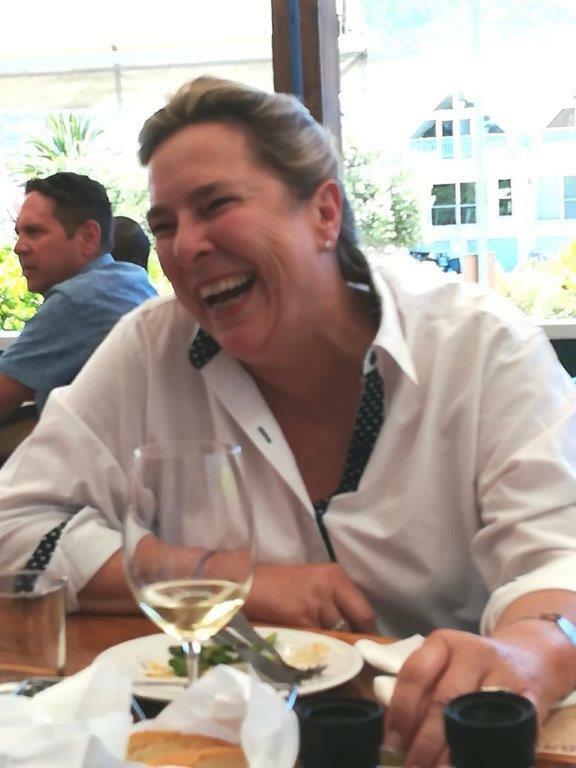 After detailed exploration of the vines and the wine in Greece, Gary and Kathy Jordan are planning to make their first, major planting of Greek variety assyrtiko on their Stellenboschkloof farm this year. I hope it adapts as well in the ground and the bottle as albariño appears to be doing so far. While albariño is the Spanish version of the grape, in Jancis Robinson et al’s Wine Grapes, it is discussed under its Portuguese name alvarinho. Just a border separates their respective homes in the northwest of Spain and north eastern border of Portugal. 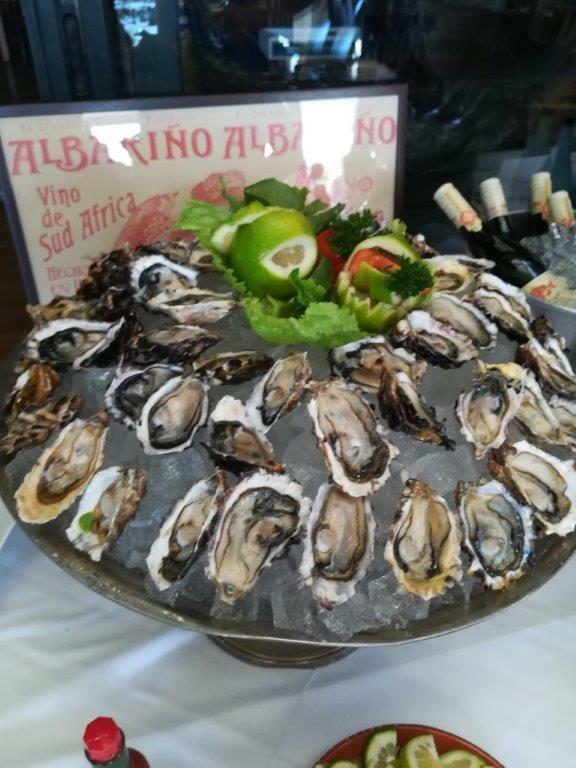 Love of seafood, both the catching and eating of it, inspired the Newton Johnsons to go through the lengthy procedure required in importing albariño vine material. 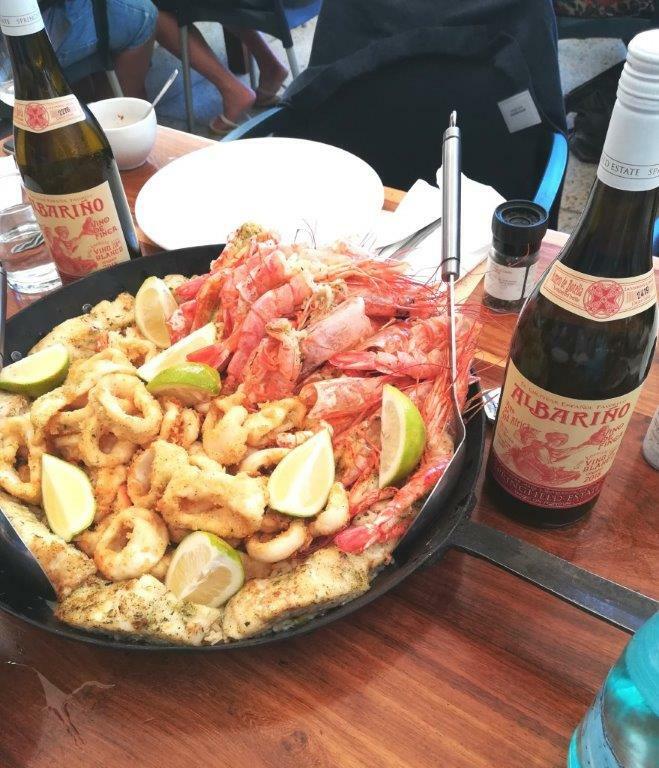 Since the first miniscule 8 litres, the wine has displayed remarkably authentic varietal character (and affinity with seafood! ), both making it a hit with consumers since the maiden, commercial release in 2015. The Springfield Bruwers also have the catching-and-eating seafood bug, but Abrie and his sister, Jeanette were drawn to albariño via a bottle shared in Uruguay (who knew there is Uruguyan albariño?). It obviously so impressed them that they considered importing the vine material – until they discovered the Newton-Johnsons had already done so. 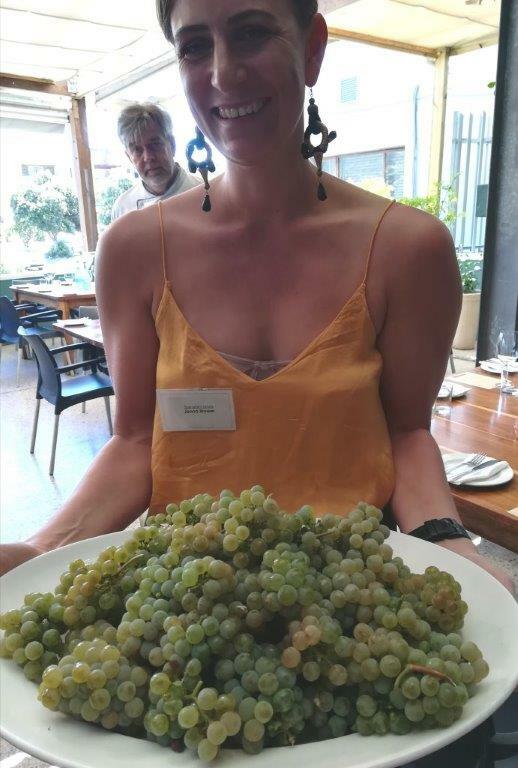 Being the delightful wine people both the N-Js and Bruwers are, albariño cuttings crossed the mountains from Hemel en Aarde to Robertson; two-and-a-half years later, Springfield Albariño 2018 proved at its launch that it too lives up to Jancis Robinson’s description and, of course, affinity with food from the sea. The eye-catching label, which leaves one in no doubt as to the grape’s origin (all the local labelling requirements are on the back (front)),should tempt further inspection. In response to my photos from the launch, a UK friend tweeted a perfect reason for choosing Springfield Albariño: ‘Sometimes you don’t want head-thumping complexity, especially in the sunshine; just a good, refreshing wine.’ I couldn’t agree more: at a moderate (for today) 12.5% alc and with that racy acid, it’s a drinking rather than thinking wine. It’s also reasonably priced at R120 ex-cellar. Those first vines yielded just 5000 bottles, but every year new cuttings are making new vines and so the number of bottles will increase in future vintages. 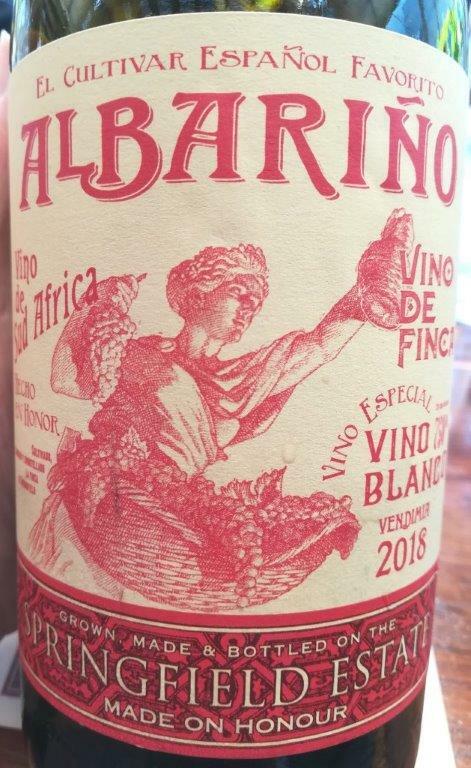 On the showing so far of both Springfield and Newton-Johnson’s Albariños (I haven’t tasted Nederburg’s, the only other one), I suggest they will add to the burgeoning reputation of South Africa’s white wine portfolio. Success is important, as it will encourage others to experiment with more varieties suited to our climate.